Reference catalogues are widely used to train personal for interpretation of radiographs and to provide a scale of severity of discontinuities in the inspected objects. Well known catalogues are e.g. the ASTM E 155 for light alloy castings and the IIW ISO 5817 for welds. These catalogues were developed especially for film based radiography. New detectors like imaging plates (Computed Radiography, CR) and flat panel detectors (FPD) enable the substitution of films (film replacement) and provide digital radiographs. Most of these detectors were developed for medical applications and are not optimised for applications in NDT. ASTM founded a subcommittee for development of a standard on "electronic reference images" in committee E07 with the goal to supply digital reference catalogues. The authors have proposed to extend the classical use of reference images with a new goal: The transformation of the radiographic reference images, taken from film radiographs (scanned with a high resolution/high density scanner), into digital radiographic images corresponding to a given non-film detector. A special software tool was developed, which permits the transformation and presentation of the reference images from master copies of film to any digital detector. This transformation requires the input of the detector properties. The user can be trained in the evaluation of these digital radiographs and he can evaluate, if significant image information is provided or degraded by the new digital technique. Examples are presented for film digitisation, computed radiography and radiology based on flat panel detectors. New digital detectors like flat panels and imaging plates are accepted as new media for digital radiology. Also film digitisation is applied more and more to archive and analyse film radiographs. There exist the risk of reduced or modified probability of flaw detection in comparison to the classical and well standardised film radiography. New reference images are necessary for flaw evaluation with these new media. The digital reference images shall be based on reference catalogues of ASTM or IIW. Digital master data (master copies) with high spatial resolution and dynamic are used to compute reference images from measured detector system parameters. Precondition for suitable master data are high quality radiographs with low geometric and inherent unsharpness. Depending on the used radiation source, digital master copies of old or new film radiographs of reference objects are digitised. The spatial resolution of the digitiser shall be 10ľm or better and its optical density range 0.5 to 4.5 with 16 bit dynamic. These master copies provide a loss less digital copy of the "classical radiographs". New digital techniques detect radiographic images usually with higher unsharpness (50ľm - 600 ľm). This unsharpness may be acceptable for specific applications or should be reduced by magnification technique. Some new digital detectors permit the data acquisition in significant shorter exposure time, which is an economic advantage. This may reduce the flaw perceptibility by increasing the signal-noise ratio (SNR) of the digital images. Digital reference images for all available detectors of the same objects would support the user's decision if a new digital technique is applicable for his or her NDT-problem. Nowadays a wide variety of radiographic detectors are available. It seems to be impossible to take reference radiographs with all these detectors. Therefore, a software tool (IMV- image viewer) was developed that enables the user to calculate the radiographic image for a given detector from the master copy. The user can obtain the master data from an organisation like e.g. ASTM and he or she can print these data on film or view them on a monitor. He obtains guidance to measure the detector parameter or obtains them from the manufacturer. Now he can use the special image viewer (IMV), which allows the transformation of digital master data into the image, which would be measured with the selected detector in connection with a possible magnification technique. Digital or electronic reference images have different image quality, if taken with different digital radiographic techniques or film radiography. Due to the available standards and corresponding film materials, the image quality of industrial film radiographs is excellent and depends on few parameters only. These are basically the exposure conditions, the film system class and the applied film screens. For NDT most operators use film-lead-screen systems. They yield a very high spatial resolution. Furthermore, the image quality depends on the optical density of the film and the selected geometrical unsharpness. The total unsharpness of film radiographs is usually much smaller than the unsharpness and/or pixel size of digital systems. On the other hand digital systems may have better SNR (Signal Noise Ratio) than films and more dynamic. This can be also obtained from digitised films by average down procedures. Finally, it is also important to mention that NDT-personnel are usually trained with films for the specific industrial sectors. It seems to be reasonable that the radiographer should accept the present film quality as level of good workmanship. Digital radiographs should be characterised in comparison to film radiographs to evaluate their quality and to find out if they are sufficient concerning there usage for acceptance/reject decisions in industry. If new techniques can be qualified in comparison to film, it should also be acceptable to apply them for applications which require film radiography due to standard's requirements. Generation of digital master data (by film exposure and film digitisation). Characteristic detector response function (Intensity as function of dose). Point spread function (PSF, Intensity distribution around a sharp point-object). Load the master data into the image viewer software. Read the detector properties with the viewer or transform software. Correct for detector response function by look up table (LUT). Filter down to detector unsharpness by convolution with point spread function. average down to detector pixel size. Add noise for adjustment of the right SNR if necessary. View (or print) the transformed digital image, to present the quality of the new detector. For generation of digital master copies from X-ray film (digitised master data), a spatial resolution with a pixel size of 10ľm is recommended. One argument for that decision is, that the downsize or average down procedure can be easily organized on the basis of a 10ľm raster without interpolation (final resolution values after average down would be e.g. : 20, 30, 40, ... 120, 130ľm). Available CR-systems (Computed Radiography) have a pixel resolution of 25ľm, 50ľm, 100ľm or 300/600 dpi. Flat panel detectors have a pixel resolution of 50, 127, 139 ľm. A 10 ľm raster seems to be sufficient, but also an inch based value could be selected. The second argument for the required 10 ľm master scanner resolution is based on the fact, that the best obtainable spatial resolution of X-ray film systems (with lead screens) can be found in this range. A line spread function was measured at 100 keV with a full width at half height (fwhh) of 12 ľm, which corresponds to about 30 ľm edge unsharpness corresponding to the Klasens' method (ASTM E1000). The unsharpness increases for higher X-ray energies and would allow to reduce the digitisation resolution from the view point of inherent film unsharpness. Fig. 1 shows the Klasens' unsharpness values in dependence on energy and penetrated steel thickness. Finally the high resolution digitisation near the inherent unsharpness limit is an excellent tool for long term achieving of films. The first original films (master films) of some international available catalogues are already worn out. Digital master copies could save those master films of the catalogues, if the hardware (original test specimen) is not existing anymore. Fig 1: Unsharpness of NDT-films (with lead screens, vacuum packed) after Klasens (ASTM E 1000) in dependence on energy and penetrated wall thickness. Digitisation of films was performed with the film scanner Primescan 7100 of Heidelberg Prepress, Kiel, Germany. This unit is a DS-50 scanner according to the European standard proposal prEN 14096. It can be used without restrictions for archiving. It is a 16 bit drum scanner with 3 photo multipliers, which work up to an optical density of 5.5. Scanned films of 10 x 25 cm2 have a file size of 500 Mbyte (with 10 ľm pixel size). This file size seems to be too large for routine catalogue applications and indeed it is. The standard proposal prEN 14096-2 recommends a spatial resolution of 15 ľm for lossless achieving at energies below 100 kV. The corresponding unsharpness should be not less than 16.7 lp/mm at 20 % MTF. For practical applications like training, classification of flaws and image processing a pixel pitch of 50 ľm seems to be sufficient (20 Mbyte), which is class DB-5. This is also a reasonable size from the physiological point of view. The human eye is limited to a spatial resolution of about 100 ľm in a distance of 30 cm on a film-viewer system. A one to one print out (with 50 ľm or 500 dpi) would take this into account and allow still some magnification. For generation of digital master data radiographs are required, which have been taken with low spatial unsharpness. This means, only film lead screen systems shall be taken, which were packed under vacuum. To limit the image noise, fine grained films shall be used. If possible, class "Special" (ASTM E 1815) or class "C1" (EN 584-1) films shall be selected. All test specimen (hardware) were exposed to an optical density of 2.3 - 4 (European testing class B) in the region of interest. If films are already available with the sufficient image quality, they can be taken directly for digitisation. The geometric unsharpness shall be less than 10 ľm for a wall thickness under 10 mm. The selection of the tube voltage should be based on the requirements of EN 444 in dependence on energy. The focal spot size for calculation of the geometrical unsharpness of the used X-ray tube shall be based on measurements by methods according to EN 12543. High quality radiographs were digitised as master data. Even if the geometrical unsharpness of thicker objects is higher, the scan was performed with 10 ľm spatial resolution to have the same conditions for the numeric transformation of the master data into typical radiographic images of new detectors. A second set of data files was averaged down to a spatial resolution of 50 ľm, which is the typical catalogue quality. This transformation provides radiographic images, which have the same quality as radiographs, digitised with a DB-5 X-ray film scanner (e.g. Lumisys LS 85 SDR). There exist different digital detectors which have different response functions, which is the image intensity (or grey value) dependence on the dose. The X-ray film - scanner system and the Computed Radiography (CR) system are two step systems. First the film or phosphor imaging plate is exposed (only film is to develop before scanning) and second a digital scanning system reads the radiographic image into the computer. Radioscopic systems and flat panel detector (FPD) systems are one step systems. They provide the radiographic image immediately after exposure by direct electronic read-out. The numeric image consist of a finite image matrix and each matrix element (Pixel - picture element) corresponds to an grey or intensity value. This is usually an integer number and its max. intensity depends on the bit dynamics. E.g. 8 bit allow values from 0 to 255 and this is a typical value for digital photography, because the human eye cannot distinguish between more than 256 grey levels on a monitor. For digital industrial radiology a system should be able to store at least 12 bit (0-4095) or better up to 16 bit (0-65535). o.D. - optical density of film. Some systems use a logarithmic amplifier after light detection to compensate for eq. (1). CR- systems are available with linear, logarithmic and square root response to the dose on the imaging plate. The logarithmic ones provide grey values which are proportional to the wall thickness of the object (if scattered radiation can be neglected). This leads to different wall thickness contrast of the radiographic images, if no image processing is applied. Fig. 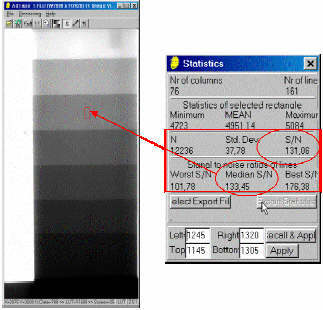 2 shows the difference between the image of a digitised film and CR exposure of a steel step wedge. a) Imaging plate system with log. amplifier. The grey level is proportional to the wall thickness. b) Digitised film. 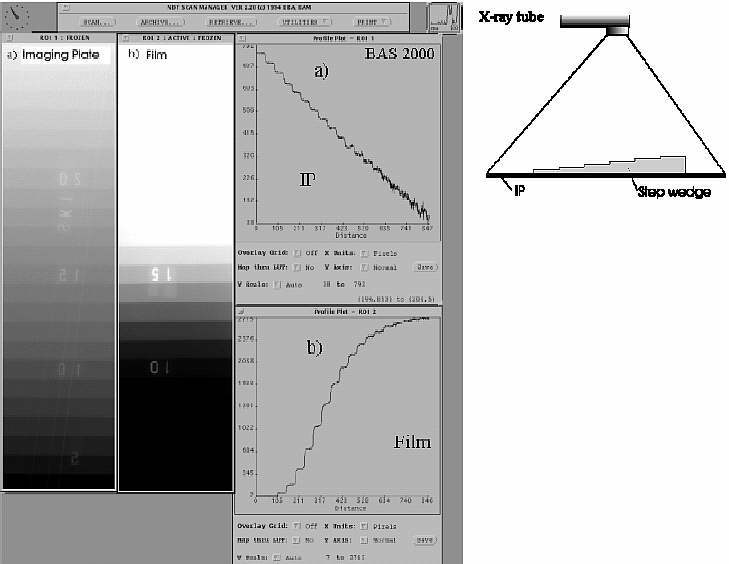 The grey level is proportional to the light intensity behind the film. FPDs provide usually linear response to the dose. Corrections are not necessary. NDT films of the classes T1 - T3 (ISO 11699), C1 - C5 (EN 584-1), Special, T1 - T2 (E1815) are usually very linear in the density to dose response. A correction may be performed with the available data from the manufacturer. 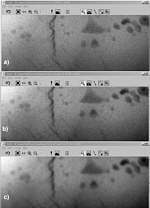 For the following examples radiographs of the NDT-films were treated as linear systems. If the detector response of a system is not available it can be measured. Two methods are known. The most accurate method is the step exposure method in accordance with ISO 11699, EN 584-1 or ASTM E1815. The principle is demonstrated in fig. 3.1. A detection system is shifted after a diaphragm in a fast shift stop mode during radiation. The stop time plus shift (move) time determines the dose per exposure field. The detector response function can be measured from the plot of grey value as function of exposure dose per field. A simplified method can be applied using a step wedge, which should be stepped in a logarithmic wall thickness scale. Fig 3.2 shows the set up for this measurement. If a linear step wedge is used, the detector response should be evaluated in a double logarithmic diagram. It is important to avoid scattered radiation. This can be done if the step wedge is exposed with a magnification of 1:2 and a distance of at least 500 mm. The X-ray beams shall be collimated just to the step wedge. The material for the step wedge should be copper or brass. The absorption between the free rays and the maximum absorption by the thickest step shall be not more than 95%. To cover the full required dynamic range several exposures shall be taken with different exposure time. The X-ray source shall be used with a small focal spot to avoid to high unsharpness of steps. Fig 3: 1. Step exposure method and 2. step wedge method for measurement of the characteristic detector response function and signal/noise ratio of films and digital detectors (example: imaging plate). where the intensity of the d -function (height ˇ width) is equal to 1. This theoretical d-function can be best approximated by a needle beam, projected onto a 2D- detection system. Due to its special construction, each detection system will respond with an image response function, that has at least the width of one pixel (picture element) with intensity one. This is a typical response for direct converting systems like the amorphous selenium detector of Agfa NDT. CR systems and all flat panel detector, which use fluorescence screens for conversion of X-rays or gamma rays into light, are usually distorted by diffuse light scattering, which results into an additional over talk to neighbour elements. The measurement of the point spread function is not a simple task. It is possible to take a plate of high absorbing material with a thin drilled whole, which should be at least 10% of the pixel size in diameter. This is difficult to manufacture. Therefore a double slit collimator corresponding to fig. 4 is recommended. Pin hole diaphragms are available for measurement of focal spot size and can be used for low energy applications (usually below 100 kV, if the pin hole is below 15 ľm). If a pin hole diaphragm is taken, the film detector distance shall be large enough to neglect the influence of the focal spot size (geometrical unsharpness). Also thin spheres may be used as inverse pin holes. In that case a very low X-ray energy is required to avoid edge penetration of the sphere. The adjustment of spheres and pin hole diaphragms is simpler for optimum beam alignment. Nevertheless, it is difficult to adjust the PSF test object exactly above the centre of a pixel. This is important for systems with narrow point spread functions like the amorphous selenium flat panel detector. If the PSF test object is adjusted between pixels the PSF is flattened by 2 (or 2x2) pixel distances. If the detector system has large cross over effects, like systems with dominant light scatter effects from fluorescence screens, this problem can be neglected. Fig 4: Cross slit collimator for measurement of a point spread function. The measured point spread function is only useful, if the detector has a high signal to noise ratio. If this is not the case, line spread functions can be measured only. For that purpose a plate with high density is used to absorb about 80% of the radiation. It is important to have a measurable intensity in the free beam and behind the plate (means: no saturation, no zero values). This applies for point spread and line spread (LSF) test exposures. The LSF-plate must have exactly manufactured edges (perpendicular). The beam must be aligned exactly parallel to the edge to measure. The distance of plate to focus shall be large enough to neglect the geometrical unsharpness. A profile shall be taken from the measured exposure and the line spread function is the first derivative of that profile (again: data must be linear to dose). This method can also be applied to images with low signal/noise ratio. In that case several profile lines may be taken (e.g. 17) and be averaged to improve the SNR of the profile and the LSF after derivation. The LSF can also be used for calculation of the modulation transfer function (MTF) . It is the magnitude of the Fourier transform of the LSF, normalised to 1. Table 1: Empirical expressions for Psp and Lsp for its conversion. K0 and K1 are the Bessel functions of the third kind. We have measured for double coated film as well as for CR systems close similarities to the Lorentzian LSF. Therefore, the PSF can be approximated from accurate LSF measurements in most cases. Fig 5: Image of a line pair test object with increasing spatial frequency and corresponding profile. The normalised real inverse Fourier Transform yields the line spread function. This method had a uncertainty for determination of MTF(0), because this value is not measured, only approximated. Fig 6: Software tool for measuring the SNR of a step wedge for a CR system. The factor 1,0179 corresponds to the correction sqrt((k-1)/c) of ISO/WD 10505 for grouping with a group size of 20 elements (k=20) for application of a median procedure (c=18,33765). Fig 7: Dependence of the SNR on exposure value (mAs). The exposure values for the different classes can be derived of the graph for the special CR-system used. SRmax  Maximum value of spatial resolution in ľm (e.g. fwhh of Lorentzian LSF). NOTE: The ISO 11699-1 and EN 584-1 require for SNR measurements with a micro-photo densitometer with circular aperture of 100 ľm diameter for the measurement of granularity sD. Because the pixels in digital images are organised in squares, the corresponding pixel size is calculated by Sqrt((100 ľm)2p/4) = 88,6ľm. The s100 value is recommended as informational value for advertised technical parameter. Due to its dependence on the used dose, the best presentation would be the graph of s100 as function of exposure dose. Due to the importance of the SNR for the perceptibility of fine flaws in digital radiographic images, the current proposal of the European (CEN, see http://trappist.kb.bam.de/UA-CR/) and the American (ASTM E07.01.02 committee) standard for qualification of computed radiography systems (CR) requires the measurement of the SNR as function of the dose (or exposure value) of the linearised measured data (see fig 7, which is the Fig. A1 of the annex of the CEN standard draft). As long as the quantum statistics is the dominating effect, the exposure dose determines the SNR by the square root law. Fig. 7 shows also the European classification which is used in analogy to the X-ray film classification (see EN 584). If the spatial resolution is equivalent to films the probability of detection can be assumed also being equivalent for the digital detectors corresponding to the marked zones in fig. 7. For adaptation of noise in the master data of the reference radiographs, noise may be added to the transformed images. Up to now all examples have shown, that the down averaged radiographs from master copies (taken with the best fine grained films) had better SNR than the measured SNR of any digital detector. Transform the master copy with the characteristic detector response function (CDR) by a look up table (LUT). The LUT can be written in ASCII and the program has a tool to read external LUTs, which are basically the measured CDRs. Filter the master copy image with the PSF function as filter function of the convolution kernel, if necessary. If the PSF is very narrow (e.g. 1 - 2 pixel as typical for the -Se flat panel detector), this step can be omitted. Usually a filter function, which is similar to the PSF, can be used if it has the same line width. Sufficient results were obtained even with rectangular filters. Average down (also called binning) the master copy to the required pixel size. It is important to calculate the average of all high resolution pixels to generate an image with lower pixel resolution. Otherwise the noise is not properly reduced and information can be lost, if the reduction of the image size is done by skipping of the fine pixels. Measure the SNR of the resulting image in an area of constant intensity. If the SNR is higher than the required system classes corresponding to fig. 7, add white noise. The resulting image should be identical to the image, taken with a detector, which has the parameters used in point 1 to 4 above. Sometimes manufacturers use image processing routines to improve the presentation at the monitor or film printers. These procedures have to be selected additionally to make the pictures comparable. Film scanners use different principles for digitisation. The best equipment is based on a point wise scanning of films. This provides the highest sharpness . Nevertheless there is an essential discussion between users, what are the minimum requirements for this resolution. Basically there exist two ways to solve this problem. On solution is the consider the inherent unsharpness of film and to derive the needed resolution for loss less digitization. Furthermore it is possible to derive the requirements from the maximum acceptable unsharpness of application standards like EN 444 or EN 1435. This is the basis for the defined values in the standard proposal prEN 14096-2. The other solution is the transformation of the master data and the evaluation of the results by experts. This seems to be closer to the American practice. Fig. 8 shows the comparison of images which were transformed from 10 ľm resolution to 50 ľm and 70 ľm resolution. The master copy is a radiograph of a weld (BAM 5) taken with 160 kV, 1 meter film focus distance, small focal spot at D4 film. The wells sample is 8 mm thick steel. Additionally a duplex wire was used on the source side of the weld to test the resolution. Wire 12 and 13 are presented for each resolution. The digital image with 70 ľm resolution shows already beginning data loss of fine details. The image with 50 ľm resolution seems still to satisfy the film interpreter. Computed radiography systems  are available with linear, logarithmic and square root detector response. This appears completely different to the operator than the film at an illuminator, which shows a light intensity according to eq. (1). The image has to be corrected by the look up table (LUT). It is essential for correct comparison to measure the SNR in an intensity linear presentation. Otherwise the measured values are too high (up to 500, instead of 130). Also the PSF or LSF for determination of the spatial resolution must be taken from the linearised image again. Fig. 9 shows a transformed image in comparison to the measured one. This show the influence of the point spread function due to the unsharpness of the phosphor image plate, which was neglected. Fig. 10 shows the same images after high pass filtering. The measured image obtains additional structural noise, which indicates a technological problem of the used imaging plate or the scanner. Fig 11 shows the same numerical experiment for the transformed and measured image of a AC-3 system of FujiFilm with an spatial resolution of 100 ľm. Both images show no differences. Fig 11: Comparison of transformed image for a) spatial resolution of 100 ľm and b) measured image with the system AC-3 by FujiFilm with 100 ľm spatial resolution after high pass filtering. The AC-3 image shows no additional structural noise. Flat panel detectors (FPD) have usually a linear detector response [4,5]. No LUT correction is required for measurement of parameters. All FPDs have usually integrated a sophisticated correction procedure for the background and the pixel sensitivity as well as the shading. Some FPDs have to be read out without radiation. Furthermore, there may exist bad pixels and dead pixels and lines. They need a relaxation time to remove image lag. This makes the situation quite complicated. Reference images can be calculated under the discussed conditions and should reflect the basic properties of the image. 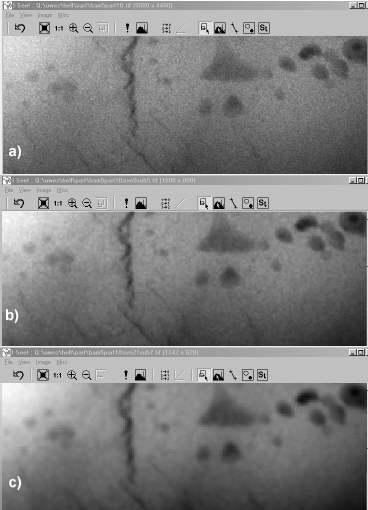 The comparison of an amorphous Si FPD with the calculated reference image shows (see fig. 12) that the FPD image is noisier than the transformed master copy. The noise is overlapped by line artifacts, which appeared as read-out artifacts caused by FDP read-out during exposure. Fig 12: Comparison of transformed image for a) spatial resolution of 130 ľm and b) measured image with the system Flashscan 20 (old version from dPix) with 127 ľm spatial resolution after high pass filtering. The image Flashscan 20 image shows additional noise and line artifacts. The concept of transforming master copies to reference images for new digital detector systems could be tested successfully. This concept should simplify the evaluation and optimization of new detector systems for practical applications. Especially the radiography with limited spatial resolution seems to raise the question of reduced probability of detection for fine details. Complete radiographic catalogues should allow the user to optimize the spatial resolution and to adapt the contrast sensitivity to its problem. This principle was developed as guidance through the new world of digital radiographic systems. It allows the direct comparison to film radiography which is the measure of quality and the basis for all training during the last decades. Safety relevant applications need still the comparison to film radiography to prepare the decision to switch to another technology. The developed tools permit the evaluation of the involved risk. The first experiments have shown, that the transformed master data have always a sufficient SNR. The application of high pass filtered images could be used to search for defect materials and problems of the new digital detection systems. Image Sciences principles, analysis and evaluation of photographic type imaging processes, J. C. Dainty, R. Shaw, Academic press, London, New York, San Francisco, 1974, Chapter 7. Casagrande, J.M., Koch, A., Munier, B., P.de Groot, "High Resolution Digital Flat-Panel X- Ray Detector  Performance and NDT Application", 15 th WCNDT, Rome, 2000, see http://www.ndt.net/article/wcndt00/papers/idn615/idn615.htm. The authors would like to thank Dr. Osterloh and Y. Onel for their contributions to phosphor imaging plate technology and software development.